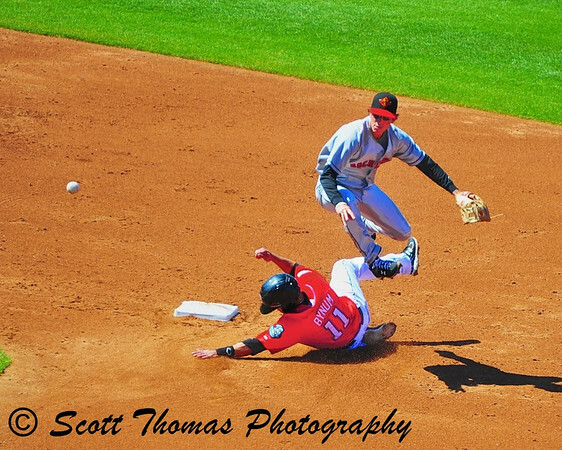 Syracuse Chiefs Seth Bynum (11) slides into 2nd base in an attempt to break up a double play in Alliance Bank Stadium, Syracuse, New York. Nikon D700/28-300VR, 1/1000s, f/5.6, ISO 320, EV 0, 300mm focal length. Finally, a beautiful Spring day greeted Central New Yorkers last Saturday. A prefect day to go to the ballpark and catch a game between the Triple A clubs, the Syracuse Chiefs and their Thruway rivals, the Rochester Red Wings. The game featured good hitting, pitching and field play. The Chiefs went on to win just their second home game this season and I have to think it was, in part, due to the weather which so far this season has seemed more like late Fall then Spring. 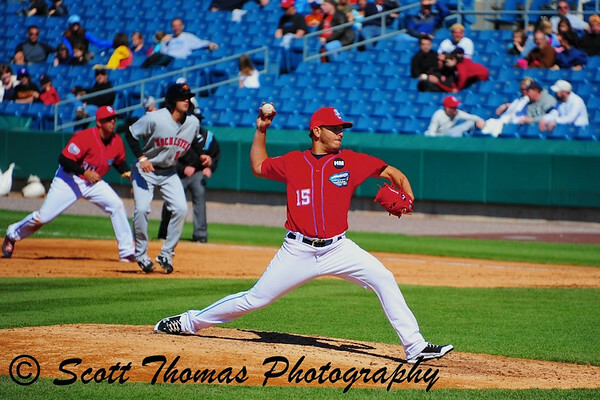 Syracuse Chiefs pitcher Yunesky Maya (15) earns the win against the Rochester Red Wings in Alliance Bank Stadium, Syracuse, New York. Nikon D700/28-300VR, 1/1000s, f/5.6, ISO 200, EV 0, 300mm focal length. 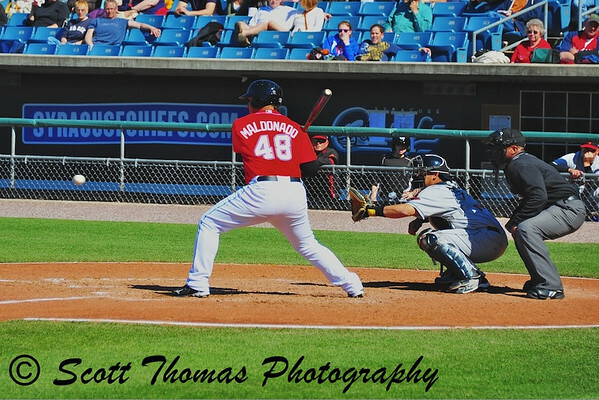 Syracuse Chiefs catcher Carlos Maldonado (48) at the plate in Alliance Bank Stadium, Syracuse, New York. Nikon D700/28-300VR, 1/1000s, f/5.6, ISO 250, EV 0, 300mm focal length. 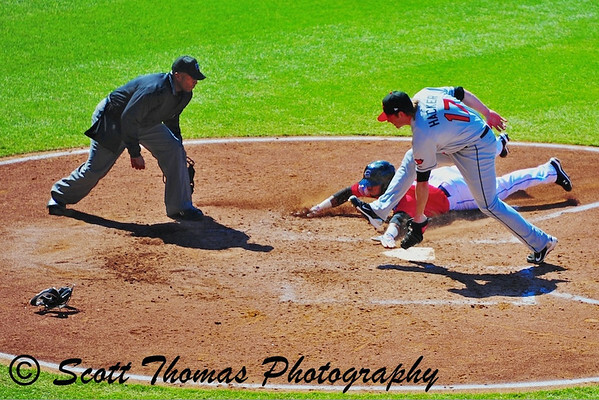 A close play at Home plate...he is safe? Nikon D700/28-300VR, 1/1000s, f/5.6, ISO 360, EV 0, 300mm focal length. Then there was this thing called the Ugly Duckling Race which was won by Yours Truly. How do you like the duck bill? 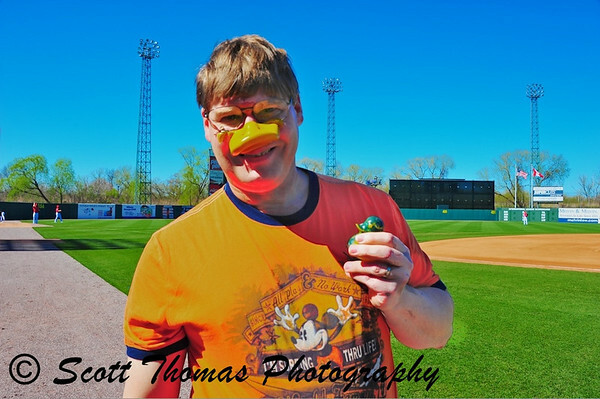 This entry was posted in Sports, Weekly View and tagged alliance bank stadium, baseball, game, new york, rochester red wings, spring, syracuse, syracuse chiefs. Bookmark the permalink. 15 Responses to View 175: Play Ball! Vibrant sports photos! Looks like a perfect, (well perfect if you are into sports…as for me a perfect day is at a beach or pool and NOT sitting in a stadium!) way to spend a gorgeous day. Be a bit cool by the beach this time of year around here. Hee, hee – cute shot with the duckie! Was that one of those rubber-ducks-in-the-river kind of races? I’ve got baseball on the blog today too! Not up close action shots like you’ve got, but still baseball. You had major league baseball. Probably not many empty seats. Sadly, there was far more empty seats for the Chiefs game than filled ones. Like my duck look? It was fun. Excellent action shots! Sad that there’s not more support for Triple A. Personally I’d rather watch that than the majors. I am with you, Terry. Minor league teams are less expensive, the players more accessible and you can get really close if you want to. The 2nd and 3rd photos were taken from the third row down the 3rd base line while I was waiting to go on the field for the duck race. In which play did you win that little ugly green duck – and that large yellow nose?!! LOL No play, I had to do a race where I had to get 5 of those green ducks to win and I did! It was a beautiful day. Today, we are back into rain. I finally see some green leaves in the last photo.